Sourdough bread provides a number of important nutrients and can fit into a healthy and balanced diet. While its high carbohydrate content can cause blood sugar levels to rise, it shouldn't cause blood sugar spikes and crashes. Blood glucose provides your body with the energy needed to make it through the day, but consistently high levels can cause chronic problems with the kidneys, nerves, feet and eyes. Though a number of factors can cause blood sugar to rise to dangerous levels, eating large amounts of carbohydrate-rich food is often to blame. The glycemic index is a 100-point scale used to measure the effect of carbohydrate-rich foods on blood sugar levels. Foods that have a high glycemic index of greater than 70 on the scale may cause sudden and extreme spikes in blood sugar levels, while those with a glycemic index of 55 or less produce a more gradual increase. One medium-sized slice of sourdough bread contains around 37 grams of carbohydrates --about 12 percent of the daily value for this macronutrient for those who follow a 2,000 calorie-per-day diet. Despite its significant carbohydrate content, sourdough bread has a glycemic index of 53 -- making it a low-glycemic-index food. As with other low GI food, sourdough bread will likely cause a gradual increase in blood sugar levels rather than a spike. Just because sourdough bread is a low GI food does not mean you should eat it in excess. One regular slice of sourdough bread counts as one grain serving. According to the U.S. Department of Agriculture, healthy adults should eat between five and eight servings of grains each day -- half of which should be whole grains. 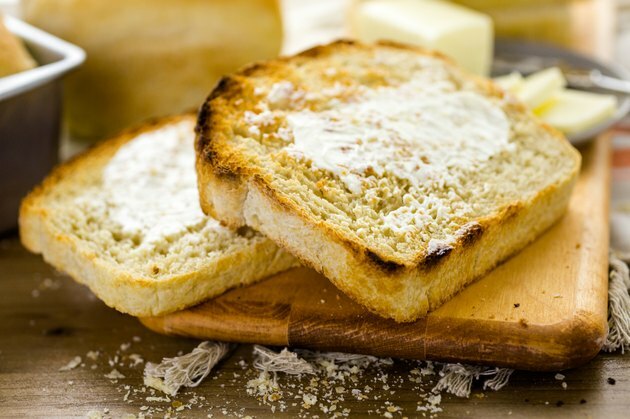 Sourdough bread is not a whole grain, but can be enjoyed as part of a healthy diet, alongside other whole grains such as 100 percent whole wheat bread, brown rice and whole grain pasta. Sourdough Home: What Is Sourdough?